Burdock is primarily a tonic and alterative herb. The cumulative effect of its use is said to bring a subtle strengthening and cleansing to the entire system. Good for removing toxins from our blood – a blood purifier ! It is popular in Japan as a source of vitamin and other nutrients. Japanese served this as a light japanese salad – julienned and cooked lightly with light soy sauce, sweet rice wine, chopped green onions and sesame seeds. I cook a nutritious soup with this burdock for the family. 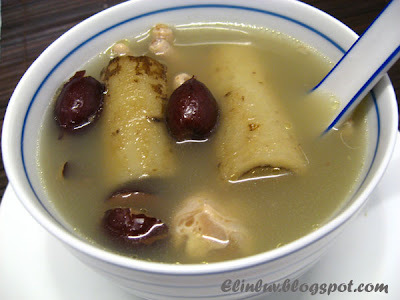 I have yet to use them in salad…..it is tasty and sweet in soup so I will definitely cook this again for the family. Boil 1.7 litres of water in a pot under high heat. When the water boils put in the chicken pieces and boil under medium heat till the scum surfaces. Scoop off the scum from the surface, lower heat and add in the burdock root and red dates and continues to simmer the soup for 3 hours under low heat. Add salt to taste. Serve hot. later your tummy, with joy. " 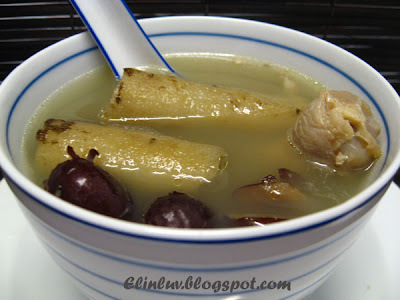 I have never had burdock..the soup looks nutritious and delicious! I'm Japanese and I've just read your comment on Piggy. This is not a book but some cake recipes translated into English. Hope they'll be of your help. 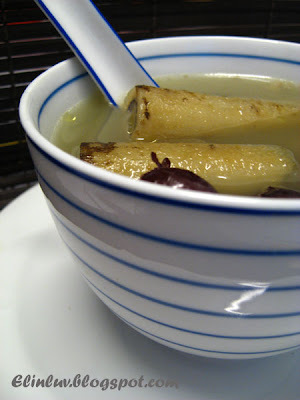 Koreans eat burdock, too, but it's more of the Japanese style--julienned, seasoned and eaten as a sidedish. I saw this at Chinatown and have no clue what to do with it. 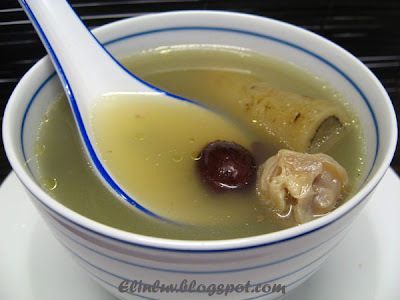 Now I know :) There is another root very similar to this called 'Wai Sun' and it is really good to make soup. 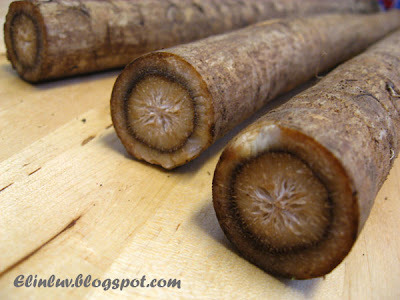 I have never seen burdock root before - maybe next time I visit our local Asian grocery, I can find it! I'm slowly becoming a health freak too - don't worry about it! I've heard of this before but have never tried! Time to hunt them down!